Items can be directed to all review participants, participants from one relationship group, or participants from multiple, but not all relationship groups. Click the new Item button at the top of the screen. 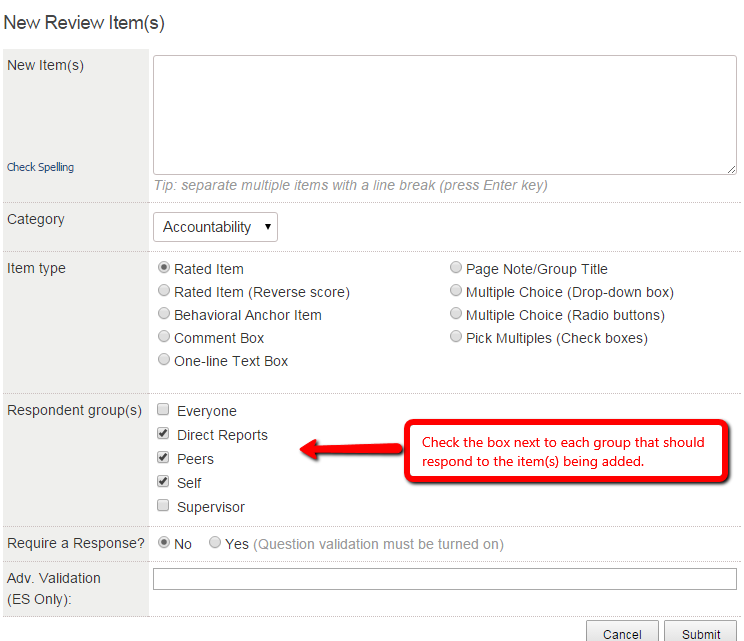 Enter your item(s), choose the item type, and then select the respondent group(s) that should respond to the item(s). Click the New Item option next to a competency. Add your item text and select the relationship group(s) that should respond to that item. Click the edit icon to the right of the item to open the item for editing. Select the check box next to the relationship group(s) you want to present the item to from the "Respondents" column. The relationship groups that you choose will be presented on the Review Items page once the items are saved. Once responses exist in a project with relationship group specific items the relationship group for a Rater should not be edited.